PJ’s Cameo and a small note McKellen gives on the upcoming DVDs. The Hobbit: An Unexpected Journey drew large crowds on Friday and set a new December opening day record with an estimated 37.5 million from 4,045 locations. In Empire’s recent video interviews with the cast of The Hobbit: An Unexpected Journey, Peter Jackson revealed a couple of interesting titbits about his intentionally mysterious cameo in the film. If you haven’t seen it already, it’s probably best if you don’t know – but if you have seen the first Hobbit movie already, here’s where he was hiding: in Erebor, dressed up as a dwarf, high-tailing it away from Smaug as the wicked wyrm blasted his particular brand of firey halitosis all upside The Lonely Mountain. But as most dwarves in the film are bearded, helmeted and armoured, it’s very difficult to make him out without knowing where he’ll be in advance. The question is then why he chose that role – why did Peter “Carrot Chomper” Jackson hide himself away from the limelight this time around? There is one scene that is missing (from the theatrical version of The Hobbit) that i helped to write: just a suggestion to underline as to why Gandalf picked Bilbo to go on the quest with the dwarves. It’s because he has met Bilbo when he was a little boy. There was a scene in which I played with him and pulled a toy dragon out of my sleeve – precursing events to come. That is gone; but, peter assures me, it is in the extended dvd version – which he has already made and cut. It’s already waiting! In our cinematic age of superhero and sci-fi films, director Peter Jackson is doing his part to shoulder the fantasy genre with a return to Middle Earth in The Hobbit: An Unexpected Journey. The first in a trilogy of films adapted from J.R.R. Tolkien’s “The Hobbit,” An Unexpected Journey sets out to tell the tale of titular protagonist Bilbo Baggins and a company of Dwarves on a quest to reclaim their ancestral home from the grip of the fearsome dragon, Smaug. The film also serves to establish an origin point for the events leading up to and through Jackson’s Lord of the Rings trilogy. The Hobbit: An Unexpected Journey is a classic adventure quest in the making; packed with colorful characters, gorgeous settings and plenty of action, the only setbacks are technical ones. Starring Martin Freeman, Ian McKellen, Richard Armitage, Hugo Weaving, Cate Blanchett and Andy Serkis, The Hobbit: An Unexpected Journey opens in 3D December 14th. Going in to The Hobbit: An Unexpected Journey, it was difficult to hazard a guess as to how much of the source material I’d be seeing on screen. With Jackson’s Lord of the Rings trilogy, he kept the book-to-film ratio at 1-to-1, with a moderate degree of variation. For The Hobbit prequel trilogy, Jackson and screenwriters Fran Walsh, Philippa Boyens and Guillermo del Toro portioned out Tolkien’s original tome to suit the needs of all three films (though it was originally only two). Judging from An Unexpected Journey, I think it’s safe to say that we’re in good hands, as far as story goes. plenty of camera time to shine. But what this picture really comes down to is right in the title: Hobbits and unexpected journeys. Freeman plays a version of Bilbo who is 60 years younger than that of Holms’ and does so with a reluctant and nebbish quality. As Gandalf (McKellen) and the company of 13 well-armed and armored Dwarves storm into his Hobbit hole and ransack his wares, Bilbo attempts to turn them away, equipped with only strong words and sulking expressions. Freeman portrays the reclusive Bilbo quite well, but comes alive as the Hobbit who remembers an even younger version of himself who was obsessed with adventure (thanks in part to an appeal from Gandalf). Bilbo, who is recruited into the company as their thief, never becomes an expert swordsman or skilled warrior, but he eventually finds the courage to take a stand and fight, making his character arc in The Hobbit: An Unexpected Journey more fulfilling than that of Frodo’s in The Fellowship of the Ring. While most of the Dwarves are window-dressing as far as character development goes, they do provide a good portion of levity within the film…perhaps to a fault. As “The Hobbit” novel was originally meant for children, its tone is lighter and its story is less dense than that of “The Lord of the Rings” trilogy. Jackson has adapted that lighter tone of the book as well as the story within it, leading to a lot more laughs than Lord of the Rings, but also an over-indulgence on silly humor. There is a scene in which a named villainous character is cut down by our heroes, but takes the time to utter a cringe-worthy one-liner. (Imagine if the Balrog had stopped to quip with Gandalf before the wizard smote his ruin upon the mountainside and you’ll get the idea.) The humor of The Hobbit: An Unexpected Journey is mostly on par with that of Lord of the Rings but there are moments clearly meant for kids in this more family-friendly installment (though it is rated PG-13 and there are a surprising number of decapitations…). The Dwarves may belch and cuss, throw plates and juggle, eat too much, drink too much and fight amongst themselves too much, but that’s all welcome fun within a company of Dwarves. Thorin Oakenshield, however, is a Dwarf apart. As I previously mentioned, Armitage brings gravitas and solemnity to the role of Thorin, especially when surrounded by the clownish Dwarves in his company. Thorin’s backstory is steeped in blood and fire, loss and longing, and he is doomed to lead his people in search of a new home after Smaug took up residence in their ancestral halls. Though Thorin also struggles with his grandsire’s affliction with the “dragon-sickness” (an obsession with treasure), this is only cursorily mentioned in the first film. Rather, Thorin’s main objective is to keep his company in one piece while making their way to the Lonely Mountain. If he gets the chance to sever the head of Azog the Defiler (Manu Bennett), a pale orc chieftain who slew his grandsire, then so be it. While Thorin is a strong and capable warrior, he still has more to learn as a leader; Bilbo manages to help him with that and much more. An interesting comparison exists between Bilbo and Thorin in An Unexpected Journey and Frodo and Aragorn in The Fellowship of the Ring. While the supporting characters are much stronger, more fully realized and therefore more easily relatable in Fellowship, the relationship between the Hobbits and the “wandering Kings” gives a strong undercurrent to each film. Upon repeat viewings, I think it’s possible to match up plot point for plot point, but in summation: the wandering King thinks the Hobbit a childish and burdensome addition to his quest but takes him along at the behest of the wizard Gandalf, then is surprised to see the Hobbit prove himself in unexpected ways over the course of the story, only to regard said Hobbit as a worthy comrade and welcome friend by the picture’s end. There you go, film majors, I just outlined your thesis for you. As for the supporting cast, most of your old favorites are back, along with some new surprises. New additions include a mostly-silent Lee Pace as the Elven King, Thranduil; Sylvester McCoy as the zany and entertaining, but oddly-used wizard, Radagast the Brown; Barry Humphries as the Great Goblin (what a weird character, both in terms of ill-conceived design – you’ll see – and as a plot device since he served little purpose), not to mention Peter Hambleton, John Callen, Ken Stott, Graham McTavish, James Nesbitt, William Kircher, Aidan Turner, Dean O’Gorman, Mark Hadlow, Jed Brophy, Adam Brown and Stephen Hunter as the Dwarvish company, who all did fantastic jobs, but weren’t given much room to breathe. Hopefully, now that they’ve been introduced, they’ll get some individual moments in the future films. Bombur (Hunter) is sure to be a kids/fan favorite and Fili (O’Gorman) and Kili (Turner) do their best to steal the show, though I preferred McTavish’s gruff warrior, Dwalin. And, of course, McKellen is fantastic as Gandalf, a role he was surely born to play. As the meddling wizard, he’s as charming and manipulative as ever. McKellen also continues to show great range as both the soft-spoken advisor, the knick-of-time rescuer and even as the upstart challenger to his superiors and mentors. There’s a great scene that reunites McKellen’s Gandalf with Galadriel (Blanchett), Saruman the White wizard (Christopher Lee) and Elrond (Weaving), all who happen to be more powerful than Gandalf. Not only does it connect the characters throughout the entire arc of Tolkien films, it establishes their relationships and actually manages to strengthen the Lord of the Rings series because of it. A small scene, but a well-directed one. And I can’t forget Serkis, who is brilliant as usual. The scene between Gollum and Bilbo is, not only iconic, but exemplary of Serkis’ performance abilities. Pros: Incredible clarity and sharpness of detail. Characters and objects in the background are nearly as clear and defined as those in the foreground of a shot. It makes for absolutely gorgeous establishing shots and exploration of new settings (Erebor, the Dwarven Kingdom before Smaug’s attack, is amazing. I’d love to see a film just about the Dwarves and their lives under the mountain). It’s great when steady or slow-moving camera work is applied. Beautiful for scenery or landscape shots; would make for excellent documentary applications. Cons: Definite “motion sickness” potential during scenes of chaotic action or fast-movement; the increased clarity often feels as if you’re standing on set with the actors/characters, so when they take a crazy tumble down a rabbit hole, for example, you feel just as disoriented…which might not be too pleasant for some. There is a bit of an adjustment period for 48fps; I was jarred by it at the start but warmed up to 95% of its usage over time. 48fps means you cannot hide mistakes…period; there were some poorly-rendered VFX sequences that were unintentionally comical and resembled the old-school tactic of filming a stationary actor in front of a moving background. These effects were bad, bad, bad; there’s no way around it. I admire and support Jackson’s decision to use 48fps and 3D going forward, but there is still some work to do to make it seamless. If you want more technical explanations of 48fps, head over to PC Mag’s explanation (via The One Ring). Another quick note on a technical aspect: most of the enemies simply had no weight to them. Goblins were tossed aside like paper dolls with the Dwarves flicking them out of the way without breaking a sweat. I can only think of a handful of instances of this happening in Lord of the Rings, such as the surge down the stone ramp leading out of Helm’s Deep in The Two Towers or parts of the massive Battle of the Pelennor Fields in Return of the King. But for An Unexpected Journey, there was no sense of real danger during most of the fight scenes, right up until the end. This is strange, because the flashback battles were, for the most part, epic and brutal and heavy, with real emotion tied in to the loss of believable warriors. On the plus side, the costume and make-up design for the flesh-and-blood characters and creatures was phenomenal, even managing to surpass the original Lord of the Rings trilogy. The greatest achievement of The Hobbit: An Unexpected Journey, is how well it ties in with the Lord of the Rings trilogy, much better than, say, the original Star Wars films and their prequels, which are widely-considered to be inferior. As we recently discussed in our Star Wars podcast, watching the films in episode order is not only visually jarring, it ruins the dramatic tension of the whole arc. At first blush, The Hobbit: An Unexpected Journey appears to avoid this pitfall. The film is set up in such a way that new viewers are briefly introduced to Bilbo and Frodo, but regard them only as an old storyteller and his nephew, nothing more. Returning viewers of the Lord of the Rings feel a bit of nostalgia for the old films and are transitioned into the new films by having a familiar starting place. This introductory scene, which some early reviewers cited as unnecessary, links the trilogies together in a much stronger way. I don’t know how Jackson plans to end his Hobbit trilogy, but the opening of An Unexpected Journey and Fellowship of the Ring are already neatly tied together. Also, “Easter eggs” are not just there for fun; they actually refer to each other in the films (depending on which order you watch them in), as well as to the source material in the books. Without giving too much away, An Unexpected Journey enriches the relationship between Gandalf and Bilbo (and, by extension, Frodo), as well as Gandalf and the elder powers of Galadriel, Elrond and Saruman. The film also explores the reasons for the deep-seated hatred between Dwarves and Elves, Gandalf’s connection to nature, the desecration of the Greenwood, the secrets of Saruman, the origin of some of the famous weaponry in the series and, of course, the lore of the Ring. So An Unexpected Journey manages to pay homage to the Lord of the Rings trilogy, while forging strong introductions to the themes that are explored in the chronologically later-occurring films, especially for first-time viewers. It’s evident that much care was given over to consideration of how to weave these two tapestries together and it’s brilliantly achieved. Special attention must be given to the musical score of the film, both for original pieces (such as “Misty Mountains,” the haunting yet stirring theme for the Dwarves) and incorporation of the themes from Lord of the Rings. The musical cues go a long way to reinforce the connection I mentioned above. While the Misty Mountains theme pervades the film, there are also ties to the Shire, the Ring and even a heroic bit of music that I won’t spoil here, but will come as a welcome surprise. The Hobbit: An Unexpected Journey has set a high bar for the next two installments, but if the Lord of the Rings trilogy is any indication, I fully believe that bar will be surpassed. Moving forward, I’d like to see the films become a bit more serious, especially since Bilbo is now in possession of a certain ring and all the grave consequences that portends. It would also be a more gradual transition into the Lord of the Rings trilogy and would allow new fans to mature along with the entire six-film arc, much like the Harry Potter films so expertly achieved. While The Hobbit: An Unexpected Journey is destined to be a stand-alone adventure classic in the vein of The Neverending Story, Willow and Legend, it is surely strongest when viewed as a satisfactory part of a greater whole. 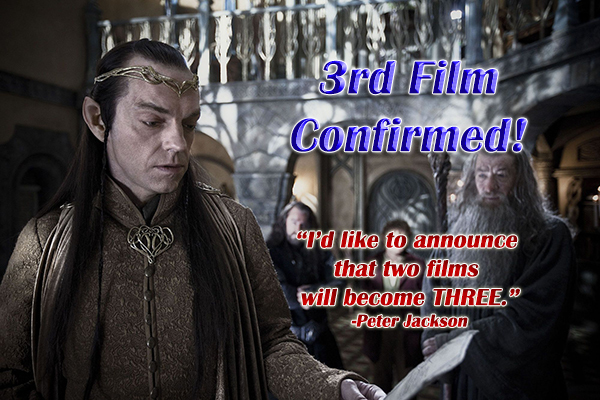 Very, very good news!Peter Jackson confirmed the third film on his facebook page! I was quite delighted to see this because it reminded me instantly of this art illustration by John Howe. After the full panel began, Jackson said that The Hobbit “is a movie made by fans for fans.” He then introduced the cast of the movie, including McKellan and Freeman. Special guest Elijah Wood then joined the cast onstage to strong applause from the audience. Freeman was soon asked a couple of questions about playing the title character. In talking about wearing the costume, he noted that for the first few days, “[the costume] feels like a fledgling duck“ but he became accustomed to it after a while. When asked if he felt intimidated joining a cast and crew that had been working together for so long, he said that he didn’t feel a lot of pressure and never felt intimidated. He recognized that the filmmakers wanted him specifically to serve in the role and that’s why he wanted to do it. Elijah Wood was then asked about seeing The Hobbit footage at Comic-Con and his impressions of it. “I was blown away,” he said. There was also a party for the wrap-up and this was mentioned in the news. Excitement bubbled over on the Wellington waterfront last night as an estimated 3500 cast and crew members of The Hobbit headed to the wrap party at the TSB Bank Arena. The public were kept strictly at arm’s length. “It’s a private party for invited guests only so there’s no public red carpet or that,” said Peter Jackson’s assistant Matt Dravitzki. Dravitzki said the film’s premiere, slated for the end of the year, would be a chance for the public to see stars on the red carpet. This weekend’s party was an opportunity for cast and crew to bond after a long shoot. So that brings us to Comic Con.